Ever since Christmas we’ve been urging our fans to help find a home for Rex, the sweetest pit bull who’d been marking time in the Santa Maria animal shelter. Well, it hasn’t happened yet but we’re one step closer. Connie Kruse and the other center volunteers brought Rex and a gang of his shelter pals to last weekend’s No Kill LA mega-adoption sponsored by Best Friends Animal Sanctuary. The Best Friends folks like Rex so much that they took him, and 10 of his pals, to stay at their beautiful West L.A. Shelter ( 1845 Pontius Ave, West LA 90025, (424) 208-8840, open 12:00 – 8:00 every day). What that means is that L.A. dog lovers and potential doggie parents can now go see him in person, fall in love, and whisk him out of there to a forever home. In case you’ve forgotten just how lovable (or, in his case, love-a-pitbull) Rex is, here’s a link to a short video of him with Connie, when she drove down to visit him yesterday. 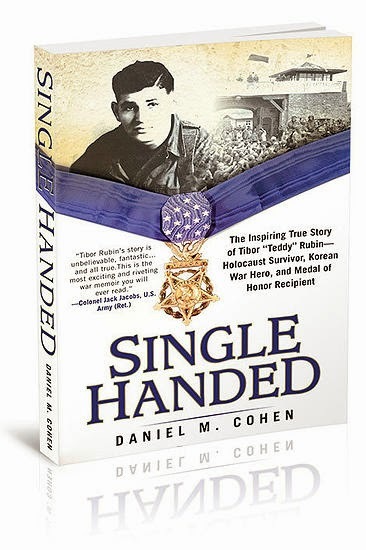 And speaking of awesome stories…If tales of bravery and heroism are your cup of tea, you absolutely must read our friend Dan Cohen‘s just released book, SINGLE HANDED, the story of Tibor “Teddy” Rubin, the only Holocaust survivor to have received our nation’s highest military distinction, the Medal of Honor. ‘Imagine you’re a young Jewish boy from Hungary who’s tossed into the Nazi death camps and forced to survive on street smarts and courage. After the Warthat same boy volunteers to fight in Korea for his newly adopted homeland, the U.S., where he displays unparalleled bravery only to be captured, imprisoned and tortured by the Chinese communists, who prove no match for his iron will and resourcefulness.’ The advance notices are terrific and Tibor’s exploits will leave you shaking your head.